Forming your own LLC isn’t rocket science, but if you need some help weighing the pros and cons of choosing to operate as an LLC, sample forms, instructions on how to get an EIN for banking and tax purposes, as well as an operating agreement, you may want to purchase our $34.95 kit available at the button below. The mailed application has a $105 filing fee. Online filings have a $50 filing fee. Missouri state wants to know the name and contact information for a real person within the state of Missouri whom can act as the contact person should the state have questions or concerns about an LLC’s operation. You can pay someone else to be this registered agent, but it’s really easiest and cheapest to just be your own registered agent. Missouri also wants to know the names and contact information for the person or people organizing the LLC. To provide this information, enter the names and addresses of the organizer or organizers onto the line labeled, “Names Addresses, of Each Organizer.” Note that you’ll also need each of the organizer’s (or organizers’) signatures for page 2 of the standard Missouri form. The effective date of the form will be the filing date unless you specify otherwise. If you choose a different date, keep in mind it must be within 90 days of filing. In the box at the bottom of the page, enter the name and address of where the Secretary of State should mail the LLC certificate. I don’t show page 2 of the standard form because all it does is provide lines for signatures, but you need to have each organizer sign page 2. 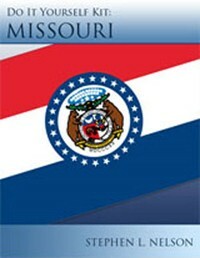 The downloadable kit shows an example of the first page of a completed Missouri LLC application. Processing lead times vary, but in general, it takes several weeks to get your LLC certificate back from the Secretary of State’s office. Online applications have only a $50 filing fee and are usually processed faster.